By Sarah Burford (Military Sealift Command Pacific) – On April 3, Military Sealift Command will bid “Fair Winds and Following Seas” to one of its most recognizable employees, Capt. Emigdia Esqueda, or Capt. Amy as most know her. A 36-year employee of MSC, Esqueda pioneered the way for female mariners and became a mentor and role model for many people who sailed with her. She is most notably recognized as the first female Master at MSC, but her career is long and storied, and during this Women’s History Month, is reflective of the long strides women have taken in the fight for equality. Esqueda’s career as a mariner began at Texas A&M University in Galveston, Texas, where, following several years in community college, she studied marine biology. One day she noticed a group of students dressed in khakis looking up at the night sky and curiosity got the best of her. Conversations with the students revealed they were cadets from the Texas A&M Maritime Academy. After a little research into the Merchant Marine, Esqueda was hooked, and even though it meant an extra year in school, she applied and was accepted into the program. People who have worked with Esqueda throughout her career are quick to point out her strong work ethic, something that could have begun while in college. Coming from simple means, she worked steadily throughout school, sometimes at three jobs, where she did everything from translating documents from Spanish to English (her parents were of Mexican descent), to waiting tables, working at hotels and anything else she could fit around her studies. During her junior year, Esqueda was promoted from the student training ship to a position on a merchant ship. This she attributes to her good grades and lack of demerits. It was here she learned about MSC and its opportunities for newly licensed mariners. At the end of her senior year, she applied for her first MSC job and was one of the lucky cadets to get one of the seven positions offered that year. In 1982, when Esqueda accepted her first position at MSC, women were still an uncommon sight on merchant ships. As a newly licensed 3rd Mate on USNS Ponchatoula (T-AO 148), she found herself facing daily challenges of being a woman in a man’s world as well as learning her job and how to lead. Realizing confidence came from not only toughness, but a deep understanding of every part of sailing and working on a ship, Esqueda not only stood her watches and performed the duties of a 3rd Mate, but also stepped into the role of Able Seaman, where she learned seamanship from the bottom up, often with only 2-3 hours of sleep between watches. As time progressed Esqueda’s confidence built and so did the crew’s trust in her and her abilities. She credits several captains who encouraged her, challenged her and taught her how to be a Merchant Marine officer and to lead people. As the years went by, Esqueda transferred to ships throughout MSC, working her way up one position at a time on various MSC ships including fleet replenishment oilers, ammunition ships and scientific research ships. In 1995, she took command of USNS Effective (T-AGOS 21), becoming MSC’s first female Master. As a Master, the bulk of her career was in command of MSC’s two ocean tugboats, USNS Navajo (T-ATF 169) and USNS Sioux (T-ATF 171). 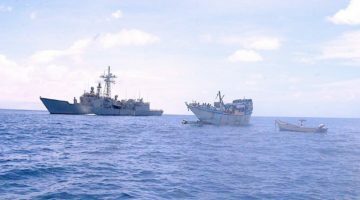 From 1995 to the present, Esqueda and her crews participated in salvage and recovery missions to retrieve aircraft, sunken vessels, and helicopters from the ocean floors around the world, and towed 42 ships and submarines. Her most notable mission came on March 2, 2014 on Sioux when she and her crew rescued the Canadian tanker HMCS Protecteur who had sustained massive damage from an engine room fire at sea. When the Navy ship USS Chosin (CG 65) couldn’t complete the tow, Sioux sailed 325 nautical miles through extremely high winds and seas and towed the ship, with 298 sailors onboard, safely back to Pearl Harbor, Hawaii. When asked about the success of her career, Esqueda over and over again credited the people she worked for and the crews that served under her. This philosophy seemed to have carried through to former members of Esqueda’s crews who remembered serving with her as master. As she looks forward to her retirement, in true Esqueda fashion, she won’t be sitting idle. Splitting her time between her homes in Oxnard, Calif., and San Antonio, Texas; working in her garden, being more involved in her church and her Star Trek club, volunteering and charity work and spending time with her husband and family are just a few of the things she is looking forward to doing. “I’m learning how to be a housewife after all these years away at sea,” she laughed. With her experiences and adventures tucked into her scrapbooks, Esqueda ends her career with her favorite prayer; the 107th Psalm.